The ink is barely dry on the ballots cast in the 2012 Presidential election and it appears that Americans are having buyers remorse with Barack Obama. 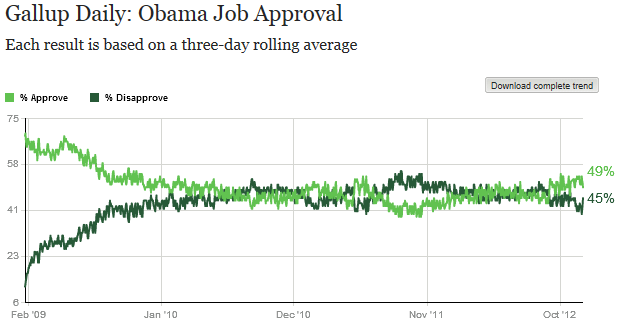 The most recent Gallup poll has Obama’s job approval rating back underwater at 49%. If America has an issue with Obama now, wait until they find out all of his campaign rhetoric was mere lies and then there is Benghazi-gate. keep on being believing the accurate polls, have far was gallup off on the election … anyone? SM: You mean people are not allowed to change their mind, really? My guess is that Americans voted Obama back in to give him an opportunity. He whined he needed 4 more years even though he said previously that is he did not turn the economy around he did not deserve another term. There is going to come a point where Obama can no longer blame Bush and what he inherited. Right now the rotton economy he inherited is his own.